Jam...Hmmm...I have to tell you the story of my hate of the word jam. I don't really know why, maybe I consider it a Yankee word for preserves. Then why am I calling my recipe jam? Because apparently everyone but me calls blueberry preserves, blueberry jam. Whatever you call this recipe you will be glad that you made it. 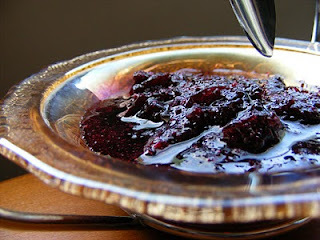 Nothing will taste better than homemade "jam" on fresh baked bread or in Greek yogurt! This is What's Cookin on Beaty's Creek today. Raven crushed my blueberries and I was glad that she did since Raine, our 3 year old, was assisting in the jam making. Okay, now I am calling my preserves jam, so jam it is. Pour your crushed berries into a heavy bottom pot and add your pectin. I will usually stir the heck out of the berries so the pectin dissolves completely. Now bring it to a rolling boil, the kind of boil that does not stop when stirred. Add in your sugar and boil for 3 minutes. Pour into 4 pint jars and seal. I process my jars in a hot water bath for 10 minutes.